Fans of X-Men probably enjoyed watching Logan/Wolverine, a mutant that can heal at an accelerated pace. In the movie Logan, he had to deal with a particular ailment and the aging process. Hugh Jackman, the actor who played Logan, looked amazing and fit the character’s role perfectly, as the actor is approximately 50 years old. However, for the role, he had to beef himself up to look like a superhero, albeit aged somewhat. He knew he had to get shredded to look the part, and Dwayne Johnson (The Rock), helped him with his nutritional needs to help him get fit. Jackman is relatively tall at 6’2” and weighs about 185 pounds. Therefore, he’s pretty light for his new frame. It’s actually amazing that he looks so beefy in the movie when you realize that he doesn’t weight that much for such a tall guy. While most people think that they can’t do the workout if they’re under 50 years old, it’s tailored to fit anyone’s fitness level or age. Of course, you should talk to your doctor first, but you can feel good knowing that this routine is effective and can help you get toned and muscular whether you’re in your 20s or 50s. Plus, it’s perfect for those who’ve never worked out before or are easing back into their fitness routine. It’s essential to note that you may not look just like Logan when you get to your ideal weight, especially if you have a different body type. However, you can still do the same moves and feel like your favorite superhero while getting fitter and healthier. Jackman’s trainer preferred a progressive overload plan that built strength using basic exercises, such as the deadlift, squats, and bench presses. The trick is to start very light with the weights with higher repetitions and gradually use heavier weights while dropping repetitions to bust through plateaus in weeks rather than months. He trained five days a week and added in up to 30 minutes of cardio, such as steady-state and HIIT training when possible. Cable Crossovers – Using a cable machine, load the machine with the appropriate weight. Grab the cable handles and ensure that your body is in the middle so that both sides get worked the same. Stand with one foot in front of the other with feet hip-width apart. Lean your chest forward, keeping the back straight and neck in alignment. Push the arms down so that the hands almost touch, keeping the arms straight and the elbows relaxed. Raise the arms back to the starting position. Perform three sets with 12, 10, and 8 repetitions, adding weight each time. Dumbbell Front Raises – Holding the appropriate dumbbells for your fitness level in an overhand grip where the palms face toward the body, raise your arm in front of you to shoulder level, keeping the elbow straight but not locked. Lower the arm back to the starting position at your thigh. You can choose to do both arms at the same time or alternate, depending on your needs. Perform three sets of 12, 10, and 8 repetitions, adding more weight with each set. Weighted Squats – Holding appropriate dumbbells at your sides and outside of the legs, stand with your feet hip or shoulder-width apart. Keeping the back straight and neck in alignment with your spine, bend the knees until the thighs are parallel with the floor. Make sure that your knees don’t track past the toes or out to the side. Slowly raise yourself back to the starting position. Perform five sets with 10, 8, 5, 3, and 1 repetition, adding weight each time if possible. Weighted Step-Ups – Using a bench or other sturdy elevated surface, hold dumbbells in your hands. Place one foot on the bench and step up, shifting the upper body forward slightly to keep balance. You can put the second foot on the bench or hover it for added challenge. Step back down with the same foot and repeat. Then, do the same amount of sets and reps on the other leg. Perform three sets of 10 repetitions each. Cable Hammer Curls – With the rope attachment enabled, select the appropriate weight. Grip the handles with the palms facing each other and arms fully extended downward. Without moving the elbows from the sides of the body, bend the elbows so that the palms are at the shoulders and lower back to the starting position. Perform three sets with 10 repetitions each. Overhead Triceps Extension – Hold one dumbbell in both hands and raise your arms over your head, keeping your neck in line with the spine. Bend the elbows so that the dumbbell moves behind the head, almost like you are shaving the back of the head. 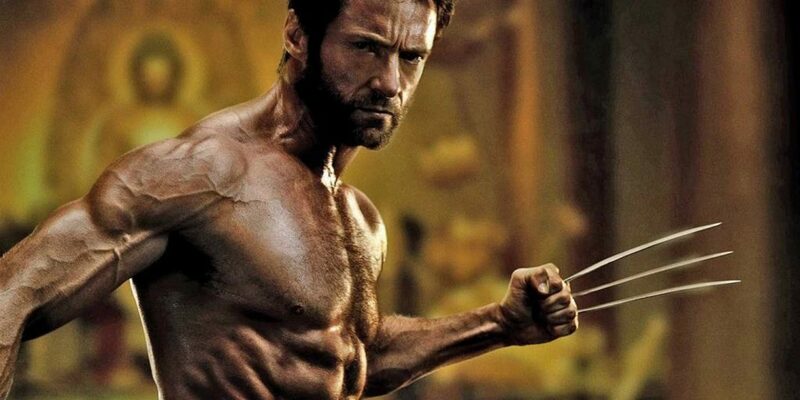 Raise the dumbbell back over the head and repeat three sets with 12, 10, and 8 reps.
Because Jackman portrayed the X-Man formerly called Wolverine and now called Logan, he essentially played two parts, but his nutrition never faltered. Every time he played the Wolverine, he stuck with the same diet plan. He actually got the plan he now uses from Dwayne Johnson (The Rock), which is amazing that another well-known celebrity would give up such precious information. He uses an intermittent fasting plan that works well for his body and needs. While there are many variations, Logan/Wolverine focused on a 16-hour window where he ate nothing, only allowing himself to eat eight hours in the day. Therefore, he’d go to bed and sleep (trying to get eight hours each night) and have eight more hours to wait. Then, he’d eat up to 6,000 calories during those eight hours, ensuring that he only ate protein and a few carbs. He stayed away from sugar at all costs. In a sense, he actually ate a Paleo diet, which can help you determine the right foods to eat during this time. If you’re looking to get ripped regardless of your age, consistency is key. Find exercises that fit you and choose intermittent fasting along with Paleo-style eating to burn fat and build lean muscle.